My first stop of the day was Harveysburg Road. As I walked to the end of the road, I was pleasantly surprised by the site of a small pod of American Coots. After spending some time there it was off to the beach. Arrived at the beach and was really surprised to spot 4 Dunlins feeding at the edge of the water. Unfortunately they stayed right out of camera range, plus the sun was right in my eyes. With the sun at my back as I was leaving the beach, trees still trying to hold onto their color. After I left there I back tracked a little to the area by the day lodge and an old road that leads down to the lake near the Southwest corner. To the right of this sign a trail lead to an observation tower. The Day Lodge is a very nice lodge that the State Park rents out for all occasions. It also has a archery range nearby. View of the lake from the end of an abandoned road in the Day Lodge area. Made my way over to the Visitors Center to see if there was anything near the dam. They also have feeders set up outside of the Visitors Center, so needless to say it was very active with all sorts of birds. A plus was a FOS Fox Sparrow and Dark-eyed Junco. Leaving there it was a long drive up to the mud flats to see if anything was there. The water has receded so much it was rather difficult to see anything so far away even with a spotting scope. Struggling to spot anything worth while at the flats, except a few Spotted Sandpipers and some Kill Deers, I made my way over to an area at the end of Ward Road. There’s a parking lot at the end of the road. After a short walk through the woods you come to the lake. And fishermen in boats. And the equals, no birds on the water. So after this I decided to call it quits. It was going on 2:00 and I was getting hungry. Unfortunately I wasn’t able to make it over near the camp grounds. I know of a spot there that I wanted to visit. Oh well, maybe next time. So I leave you now with a nice walk in the woods and my list for the day. Two announcements to make concerning “Haiku Corner”. I decided to chance the title to “A Birder’s Haiku”. I guess I didn’t like it any more, and since it’s my blog I can do whatever I feel is necessary to make it better. And second, I have acquired a collection of 20 beautifully written bird Haiku by Narayanan Raghunathan. These Haiku were found on the internet for everyone’s enjoyment, so I thought I would share them with you. The first one will appear this Sunday morning. Enjoy! Even though I don’t consider myself a beginner (I’m more of an advanced novice) I just can’t help loving a book that is for the beginning birder. I happened upon this title while I was looking through the nature section at our local Half Price Books. And since it was half price, I decided to buy it. I’m always looking for helpful hints or suggestions that will make me a better bird watcher. And since this is a book for beginners, I will take it and use it as a display for when Phil and myself teach Bird Study Merit badge in the spring. So onto the book. At 224 page this book is more into the travel aspect of birding than helping the beginner birder. As the title implies, travel, is the operative word. And since the bulk of the book is about traveling to various birding destinations, let’s start here. The book lists 18 different birding locations in North America, starting in the East at Bonaventure Island, Quebec to Hawaii Volcanoes National Park. Which I know isn’t a part of North America, but for the sake of argument let’s pretend. Locations described are as diverse as the birds that frequent its habitat. A different author imparts his or her own take on the birding highlights of their particular area. If warblers are what you’re after, then maybe Point Pelee National Park is where you need to plan your next birding adventure. A brief description of the park or specific location is briefly narrated by the author. Then the chapter turns into a travel guide for the birding tourist. Where you should start, and where to go in between. They really do take the guess work out of birding in an area where you might not have been before. I like this part. Trails are described with the kind of birds you will encounter along with the trail names. And each section has wonderful maps and pictures. At the end of the chapter they have a special section titled “Travel Tips”. They answer the questions of “Where to go”, “How to get there”, “Getting around”, and “Handicapped access”. Park address and phone numbers are provided, along with lodging and camping information. They also give you numbers so you can hook up with a guide if you want, or even take a birding excursion. This section alone should be enough for any world traveling birder. So at only 224 pages, and having 18 different birding destinations to go over, you get the idea that they can only cover so much. The average chapter is about 8 pages long. However they accomplish quite a bit in those pages. So don’t underestimate the content by it’s length. I only wish I could travel to half of the places they describe. Now onto the shortest section of the book. They call it “Preparing for the field”. It starts with a brief evolutionary history lesson, then proceeds into the natural history of birds in general. This section is OK, but I’ve read better. “Getting Equipped” is all about optics. From choosing the correct kind, how much to spend, to how they work. They treat spotting scopes the same way they treated binoculars. Field guides are given the same too few pages to assist you in choosing the right field guide to purchase. They don’t endorse one guide or author over another, however they do drop a few names to get you pointing in the right direction. The area on capturing birds on film was the most useful from my point of view. Being a rank amateur when it comes to taking bird pictures, I’ll absorb whatever I can find. They offer picture taking tips, and what kind of gear to buy. 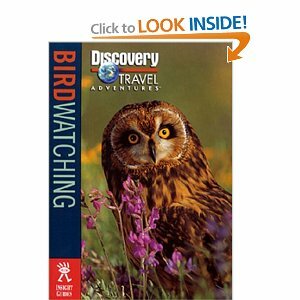 Other chapters teach the beginner on “Tips and Techniques”, “Identifying Birds”, “Migration”, and “Birding on the Road”. All these chapters offer the beginning birder some wonderful information. These chapters may be packaged in a unconventional book, however you can’t deny the information to be accurate. As an extra little bonus they throw in little tid-bits on Birding with Children, Birding Etiquette, Birding by Ear, Mating Displays, and Accidentals and Vagrants. After reading these chapters over a couple of times, granted they are no very long, but they are useful for the beginner. The best read for me was the last section. The “Resource Directory”. Three pages, in rather small print, covering Field and Identification Guides, with the authors name and publishing house. There is a listing for Regional Guides and Bird Finders, General Resources and References, Bird Photography, Books for Children, Magazines, that includes their web address, mailing address and phone numbers. Popular Web sites are listed as are Tour Operators. They even include addresses and phone numbers of manufacturers of optical equipment. There’s a lot of useful information on just 3 pages. As I wrap up this review, one point I want to make. Don’t judge a book by its cover. Even though this is more a travel book than a guide for beginners, they have gathered some good authors and put forth some good information. In the future if I happen to be planning on a birding adventure that is mentioned in the book, I’m heading here first. But try not to pay full price. Sitting at my desk this morning, looking out of my window at the gray clouds being shoved from behind by an approaching storm. With the onset of sunrise being no more than the brightening of the grayness, I couldn’t help but notice the massive flight of birds. This is the 2nd day I’ve noticed this, but today the flock appeared never ending. Starlings and Grackles leaving the safety of their overnight roost, heading out in a endless stream. Tens of thousands of familiar silhouettes hurrying in front of the impending storm. This procession lasts for several minutes as they fly low over the tree tops.